Can you think more expansively and connect the dots? Dave Gray says you can. This is one of those books where you sit there nodding and thinking, “he’s got it!”. Or you’re going to be utterly puzzled by it. It’s going to depend on how your brain works. Others have tried in the past to explain this kind of mindset, but Dave’s effort does a good job of aggregating some of the thinking out there on working this way, bringing it together and making sense of something that’s been inadequately described previously. If you’re one of those people for whom tangents, random ideas, joining the dots, bringing together disparate and apparently unrelated ideas, and leaps of faith and logic are the way your mind works, you’ll be delighted that someone has finally given this a name, and spent the effort to write down how this works and why it’s beneficial. For others, I suspect they’re going to wonder what Dave Gray is talking about. 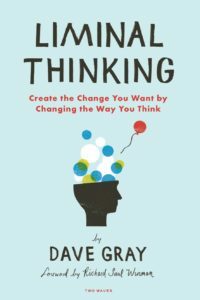 If I think about my experience, the times I’ve tried to explain what I do in my work and the way my mind worked by reaching for disparate threads to draw together to make sense of the world and the problems I work on to linear, process-driven thinkers and had them look at me like I’m mad, I suspect Dave Gray has lived the same experience. I’d hazard a guess that that experience is part of what drove him to write this book. I think for those in between, Liminal Thinking will prove a valuable tool to putting words and practices around their thinking and using the guidance in the book to help get better at the thinking it espouses. Share the post "Can you think more expansively and connect the dots? Dave Gray says you can." Reader of many things. Finisher of some. Australian. Welp, this goes on the list. Right up my alley. Happy to talk design thinking, creativity, etc. any time! You (probably) know how to find me.